Overall size: 23" x 31"
* The Artist's Edition is similar to an artist's proof. The print is the same as the General Edition, but the print run is smaller. Dedicated to the spirit of the helicopter gunship pilot, this print honors the proud history of attack helicopters. 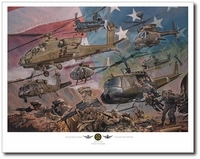 The dramatic print captures over 40 years of U.S. Army aviation history. 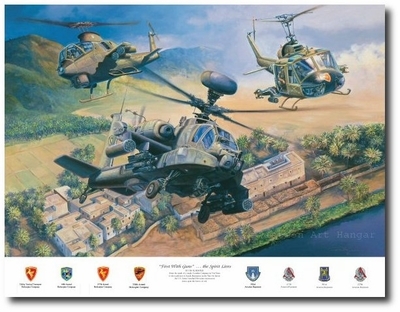 Beginning with the Huey UH-1B in Vietnam, transitioning to the AH-1 Cobra and finishing with the Boeing Apache Longbow over an Iraqi backdrop, this print has something for every gunship fan.